The map above shows some of our stops over the past two months. The red icon is Bali, the yellow icon is Kumai, Borneo, the white is Belitong Island (our last stop in Indonesia), and the green is Singapore. The map above shows our stops in the past month. Belitong (Indonesia) in white, Singapore in green, Port Dickson, Malaysia in red, and Pangkor (Lumut), Malaysia, our current location, in yellow. We are in Singapore. 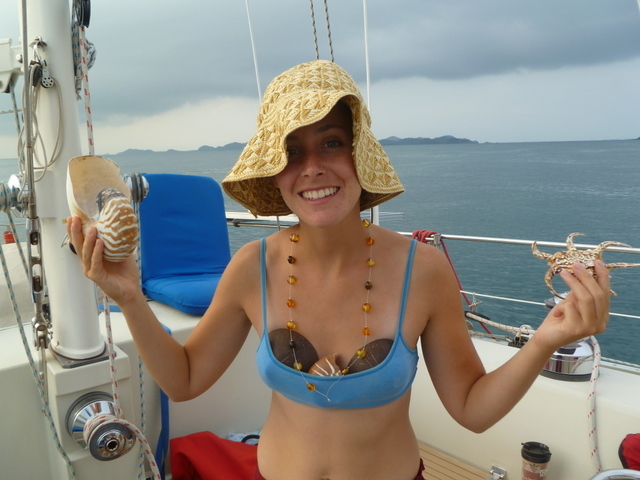 We left Belitong late in the afternoon of October 11 for a 44 hour sail to Sebangka Island. We rested for the night at anchor at Sebangka and then day sailed to Batam Island, rested for the night, and then sailed the remaining 9 hours to the Raffles Marina in Singapore, arriving yesterday (October 15) in the afternoon. 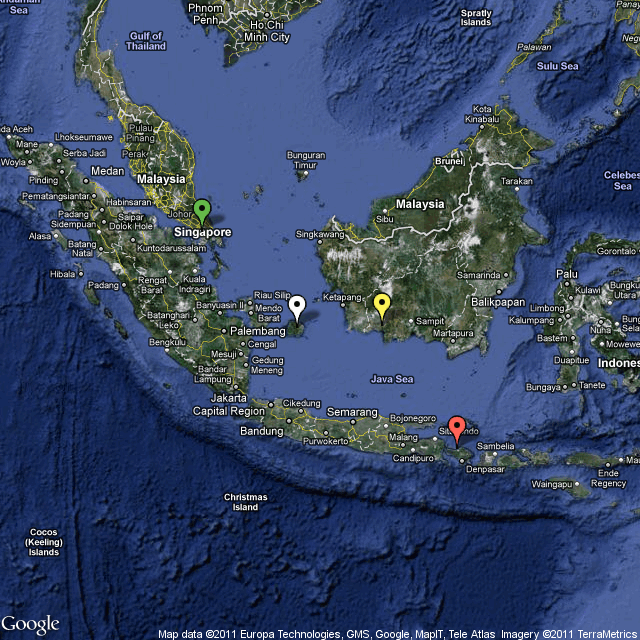 At about 7 am on October 13, Sabbatical III crossed the equator just south of Kentar Island. The last time we were in the northern hemisphere was late March 2007 when we were a day away from the Galapagos Islands on the passage from Panama. It is a tradtion among mariners that those aboard must be initiated the first time they cross the equator by boat. At 7 am on October 13, the “tadpole” Hannah was initiated by King Poseidon (see photo below) and Queen Neptune (not shown as she was taking the photo). 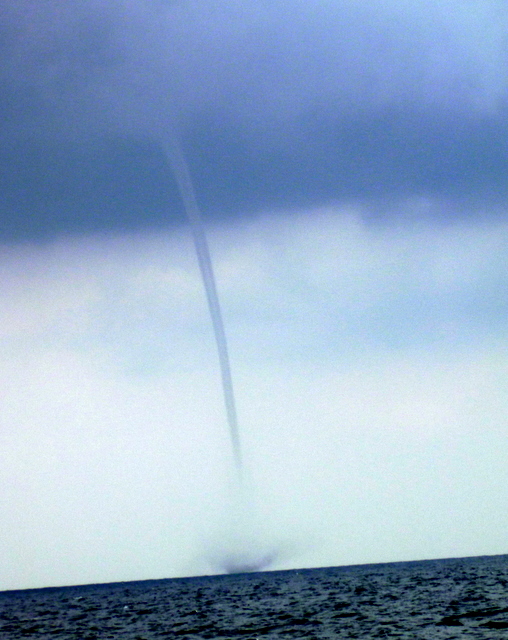 Also, noteworthy on that day is the passage of a waterspout (tornado over the water) that passed within a mile of Sabbatical III. 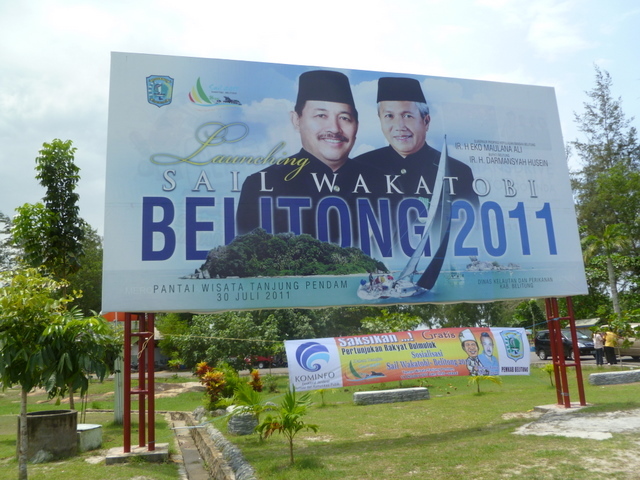 We will post photos from Belitong and blog about Singapore in the coming days. 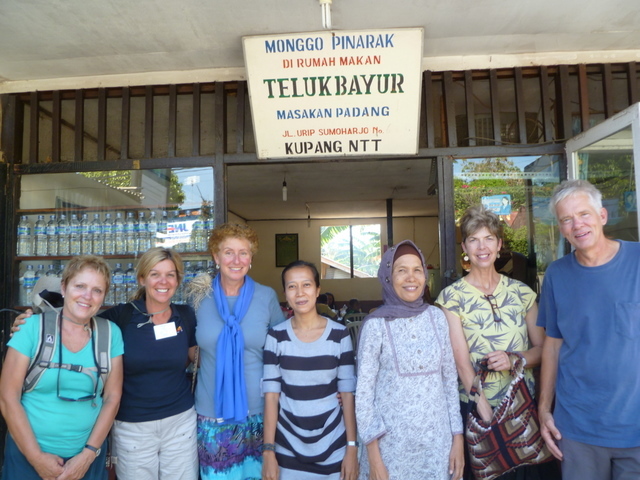 We have been in Belitong for nearly a week now – our last stop in Indonesia. We have never encountered a more welcoming place. 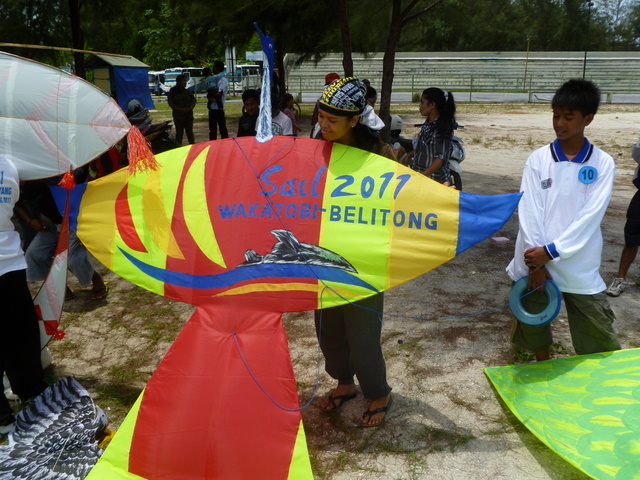 They have made all the cruisers feel so welcome – with huge “Welcome Sail Indonesia” ” Sail Wakatobe Belitong” banners all the way down the beach and down the road for 20 miles or more – traditional dancing everyday on the beach – events and tours and meals for us every day. The people here are so friendly and everyone wants to take our picture. I think we must have posed for 40 different families already. The water is lovely and the beach is clean and we have been able to kayak everyday – early in the morning when it is calm. The weather is starting to change as we get nearer and nearer to the equator and later in the season – and we are starting to see thunderstorms almost daily. Last night was the final event of this year’s “Sail Indonesia Rally”. We had a fun evening on shore with some speeches by local dignitaries (a bit boring), followed by lots of traditional dancing, and then very funny performances by various groups of sailors. We are sad to leave, but it is time to get to Singapore with Hannah. We leave this afternoon and it will take us about 4 days to get there – with a few stops on the way. 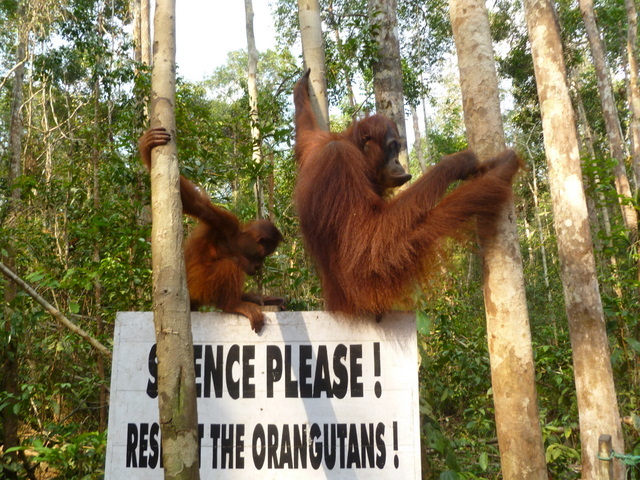 We just got back from a two day/one night trip up the river near Kumai (Borneo) to see the orangutans in Tanjung Puting National Park. This is the main, and only, tourist attraction in this part of Borneo, and it was one of the things we have most anticipated on our tour through Indonesia. We signed on with “Herry”, a local tour guide operator who has a very good reputation among other sailors who have been here in previous years, to take a tour up the river on a local klotok (a wooden boat – see pictures we have posted). The boat has a big deck on top, open, except for a canopy overhead to protect you from the sun and rain, that was our private space while our “crew” including a guide, a pilot, a cook and a “boat boy” worked mainly on the lower deck to take care of everything we needed on the trip. The klotoks are very simple, but felt quite luxurious to us as we are so used to doing everything ourselves and suddenly we had people making us food, steering the boat, cleaning up after us, serving us tea, etc. 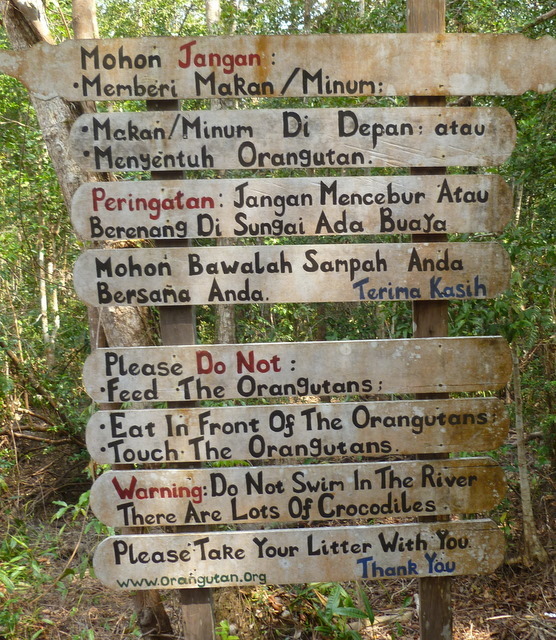 The boat ride takes you up a narrow river, lined by thick vegetation up into the national park where the orangutans live. The ride is lovely with many types of monkeys in the trees overhead, tropical birds and even some crocodiles and large lizards. 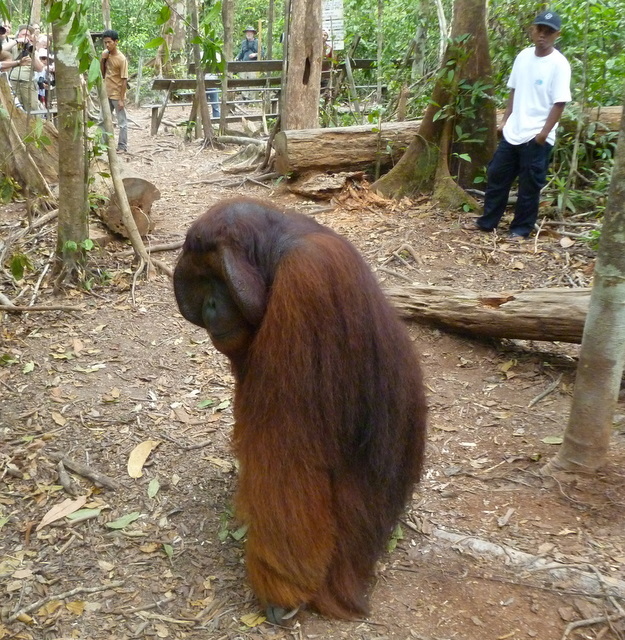 Our guide was named Seapon and he is a native Dayak (an indigenous ethnic group in Indonesia) who spent 11 years working at Camp Leakey (the main site for the orangutans). 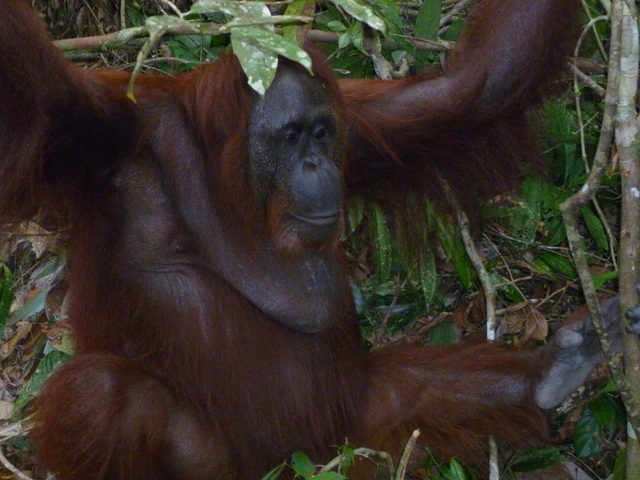 We stopped at three places over the 2 days and hiked into the jungle to view the orangutans who come down to specific feeding sites. They were pretty amazing and we took lots of great photos. 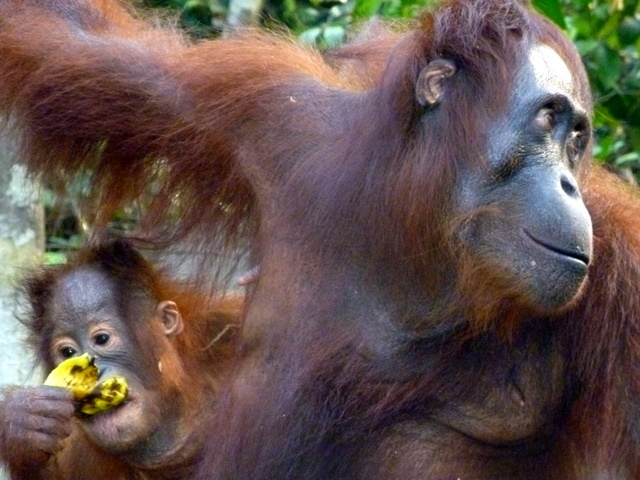 In between orangutan viewings we were entertained by our guide Seapon and were fed wonderful meals. We anchored in the river at night and the crew set up our beds for us – thick mats on the floor of the deck – and covered each bed with mosquito nets. The crew sat and fished from the boat while Mark and Hannah and I had dinner and just sat in the candlelight talking and listening to the wonderful jungle sounds. 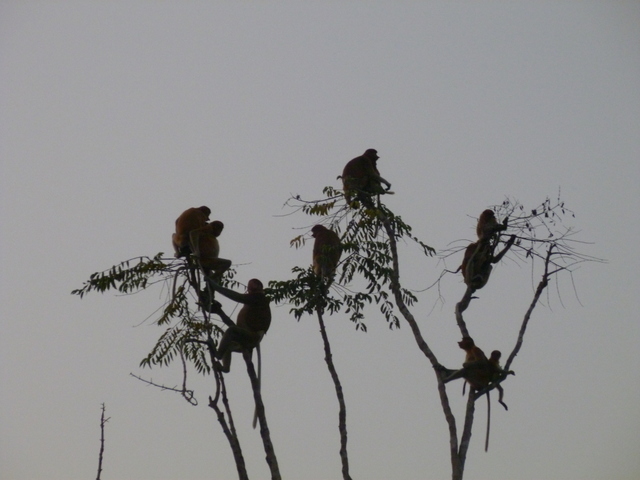 At dusk there were hundreds of monkeys in the trees lining the river – including the fantastic proboscis monkeys ( they have huge long noses) and then after dark the trees were just filled with fireflies. It was a terrific trip. We had a great trip to Bali. Hannah was especially smitten with the place. We left our boat for three days and went up to a beautiful little village called Munduk which is up on a high mountain ridge – ringed by mountains and terraced rice fields. We stayed two nights in a beautiful Balinese bungalow called “Puri Lumbung”. 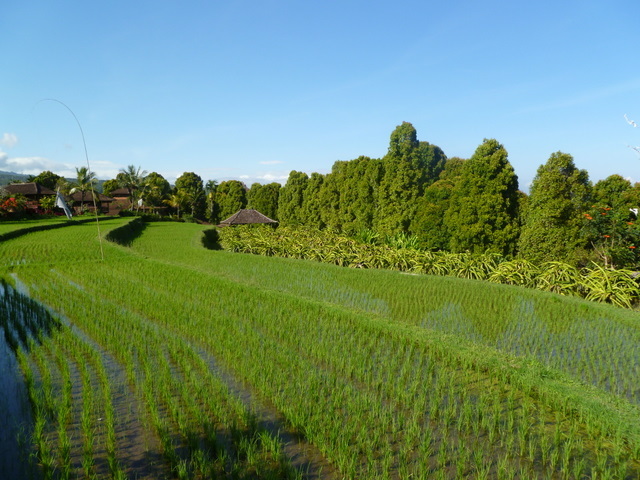 We had a private little cottage overlooking the rice paddies with a lovely balcony and a big mosquito net over the beds (which was fortunately not necessary as it is the dry season in Bali). It was not a huge room, but felt so spacious compared to the boat. It had all the hot water we could use, a beautiful buffet breakfast….. luxuries that we don’t get normally while living and traveling on the boat. The grounds were landscaped so beautifully and we spent a fair amount of time just wandering around admiring the lovely setting. 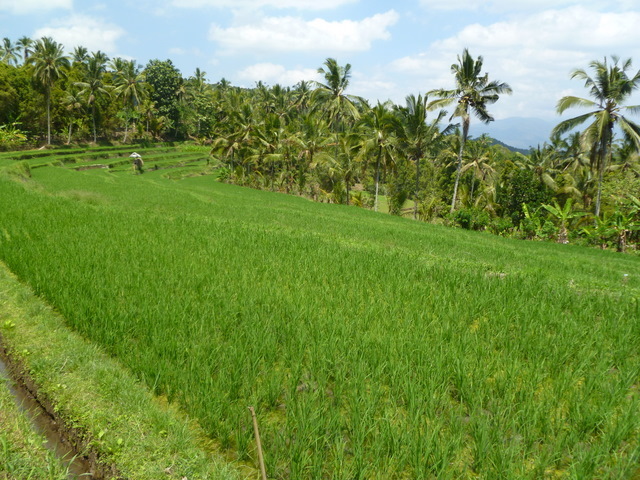 That area of Bali is known for great hiking and we spent most of an entire day with a local guide walking up and down the steep terraced fields, in and out of various villages, up to a waterfall, and through coffee and clove plantations. It was very beautiful. We had to get back to the boat since we are not comfortable leaving it in any anchorage unattended for two long. Gwen and Don, two friends of ours who were baby-sitting another boat volunteered to turn on our generator twice a day while we were gone and keep our batteries full and our fridge and freezer running. 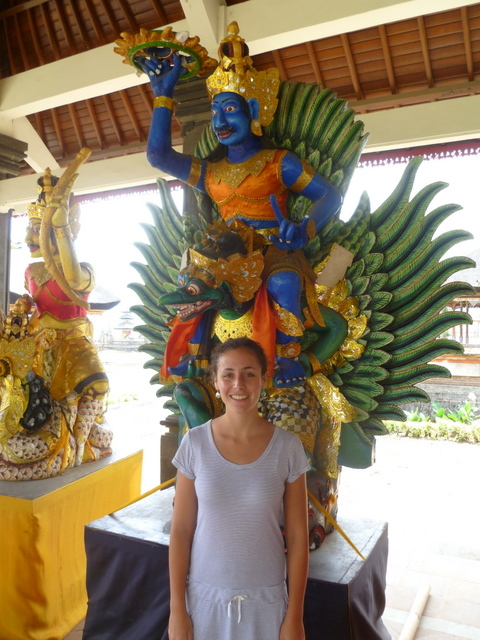 Once we got back to the boat Hannah decided that she would like to go see Ubud – the center for arts and culture in Bali. 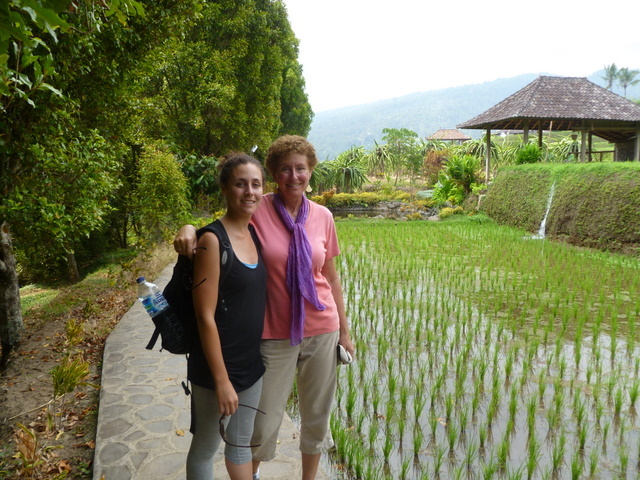 She took a shuttle bus there and found a beautiful little “home-stay” in Ubud ($10 a day including breakfast!) 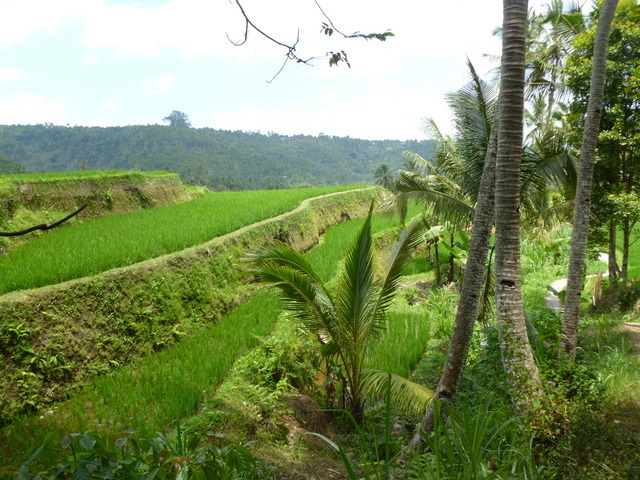 and had an amazing adventure – meeting a lot of Balinese, watching a Balinese dance class and then arranging for a private lesson with the teacher, getting invited to the teacher’s house in a nearby village, attending a cremation ceremony and a wedding ceremony (separately of course), and just falling in love with the beauty of true Balinese culture. A lot of Ubud is very touristy, but she was able to find her way out of that stuff. There were a lot of “Sail Indonesia” activities while we were in Bali as well. There must have been 70 sailboats from all over the world there at the same time – all in the same anchorage – all having started with the Rally in Darwin, Australia like we did. There were organized activities every night which were fabulous – Balinese dance and gamelan music on the beach for all the cruisers to enjoy for free. I had not seen Balinese dance for 30 years, but it was as beautiful as I remember it. The last night of the rally there was dancing and music and a big dinner party on the last night of the rally and we all enjoyed it –complete with crazy fireworks being set off about 10 feet from where we were eating- and funny karaoke singers with sailors joining in full voice. We left Bali on Saturday (November 24) at 1:30 am heading for Kangean Island in the Bali Sea. We arrived there at 4:00 pm after a rolly sail with plenty of wind, and anchored next to our friends on “Gosi.” We were very tired since we had little sleep the night before but after a good night’s sleep, we got up early on Sunday (6:00 am) ready for the 2 ½ day passage to Kumai in the province of Central Borneo (Kalimantan Tengah), across the Java Sea. There was lots of traffic to avoid in the Java Sea. There were scores of fishing vessels, many of them quite small and without lights. There was substantial international shipping traffic, such as tankers heading for Brisbane, that broadcast an AIS signal warning us of their approach, but also lots of Indonesian inter-island traffic without AIS or the internationally required sets of lights. These included tugs pulling enormous barges loaded with coal from Borneo. We had to scan the horizon constantly during the night, plus check the radar looking for targets. Night watches were very tiring compared to those we experience sailing across the Pacific Ocean. We often had to change course to keep clear of other vessels. Having Hannah on-board was a great help. She was with each of us for half of our night watch, scanning the horizon while we fiddled with the AIS and radar, or just relaxed a bit in the cockpit. We had enough wind to sail about half the distance to Borneo, motoring the rest of the time, which is about what we expected. We wound our way up the brown water of the Kumai River, the banks of which are dense mangrove and rainforest, for 3 to 4 hours until we arrived at the town of Kumai about noon yesterday. 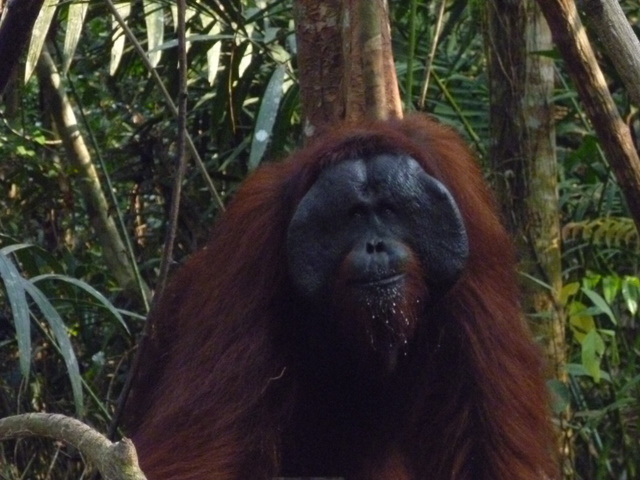 The town is adjacent to a large national park that contains orangutans (the only great ape found outside of Africa), proboscis monkeys, and a variety of other remarkable creatures. 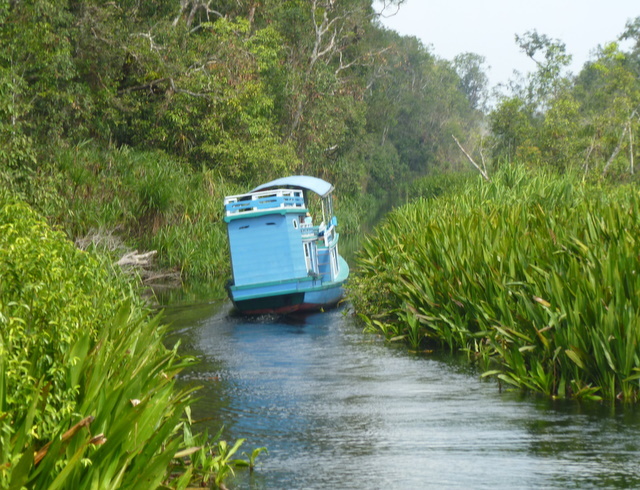 The only transportation in this area is by boat on the myriad rainforest rivers. 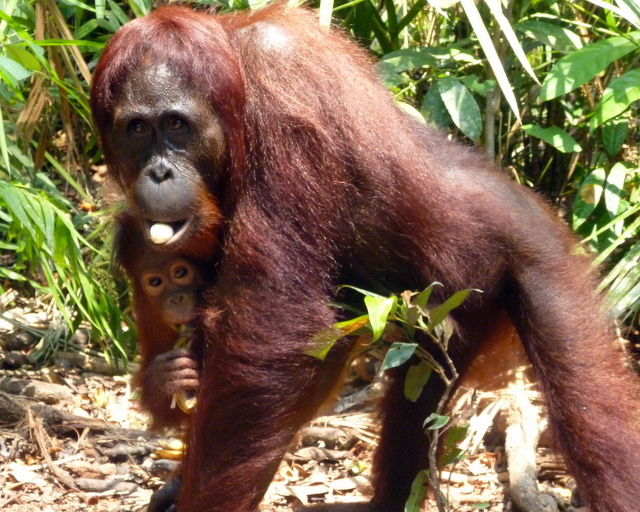 Tomorrow we will take a two day trip on a local klotok (wooden boat) to see the orangutans and monkeys at Camp Leakey and other research centers in the interior rainforest. We will sleep on the deck of the klotok, under mosquito nets. We will have a captain, a boat boy, a cook, and a guide. Should be exciting, and no night watches. L. & M. & H.
We have been so busy enjoying ourselves with Hannah, that we have been terrible bloggers lately. 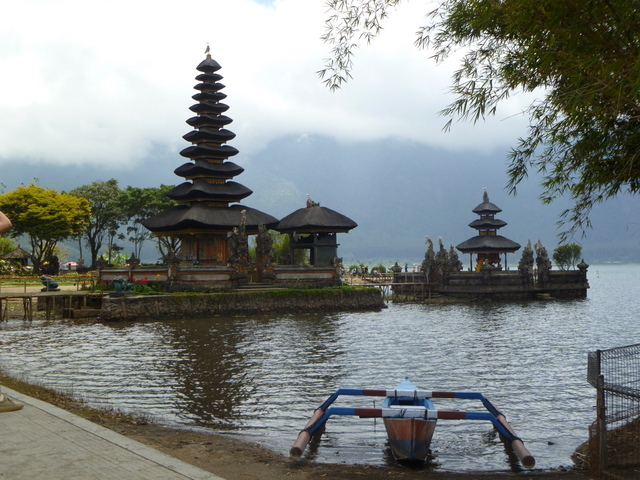 Lots has happened and I cannot recite events now since we are packing for a three day trip into the central mountains of Bali. We are currently at Lovina on the northwest side of Bali after a surprisingly fast sail from Gili Air. We spent 8 days at Gili Air, a small island just off the north coast of Lombok Island, where we were able to eat out in a restaurant every day, buy mangoes, pineapples, and other fresh fruit and vegetables, swim and snorkel, and take long walks. Hannah took the 3 day PADI Open Water scuba course and is now certified. She did four dives as part of the course. We will be in Bali for one week. There are 3 days of Sail Indonesia Rally events here, and about 50 sail boats are now crowded behind the reef. 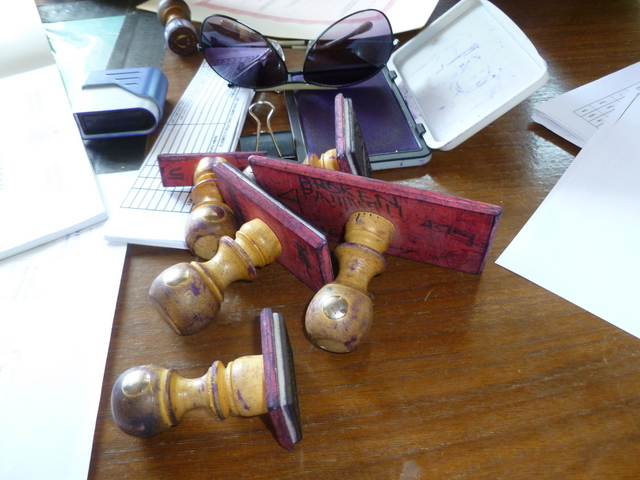 We will write more after we return from our Bali mountain retreat. We have had Hannah with us for 10 days now and have been too busy (and sometimes too tired) to write. 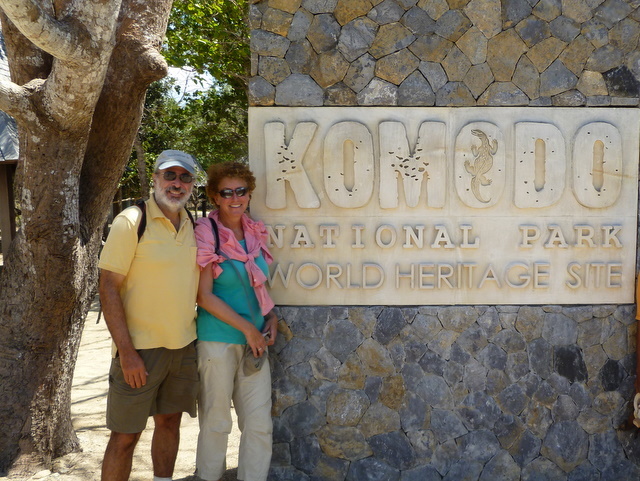 We are having a great time – have sailed a few hundred miles with Hannah – through the Komodo Islands , past Sumbawa and on to Lombok (right next to Bali). We have taken her for a hike to see the komodo dragons, had some amazing snorkeling in the komodo islands, done lots of kayaking in beautiful deserted bays, seen wild deer, wild boar, and sea turtles, had two over-night sails where Hannah shared in the night-watches, introduced her to lots of other sailors, and we are now enjoying the resort atmosphere of the tiny island of Gili Air. This place is filled with backpackers and restaurants and dive shops. 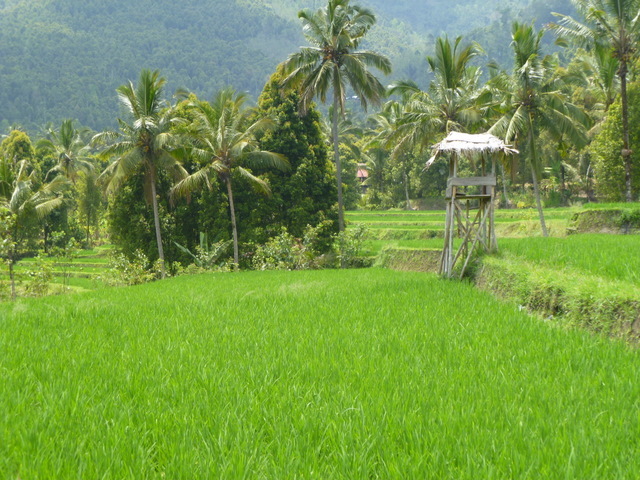 It is a little like Bali of 30 years ago – low-key and hassle free. Hannah is currently taking a 3 day course to get a diving license (that’s diving, not driving!). There are tons of restaurants here , all overlooking the beach, and they are good and incredibly inexpensive so we have been eating out a lot. It doesn’t get much better than this…..
(Our route with Hannah has gone from Labuhan Bajo (western Flores Island) to Rinca (western Flores Island) to Pantai Mera (Western Flores Island) to Batu Monca (Western Flores) to Pulau Medong (Sumbawa) to Gili Air (NW Lombok). We will be here for a few more days and then head to Bali! A lot has happened since we posted our last blog. 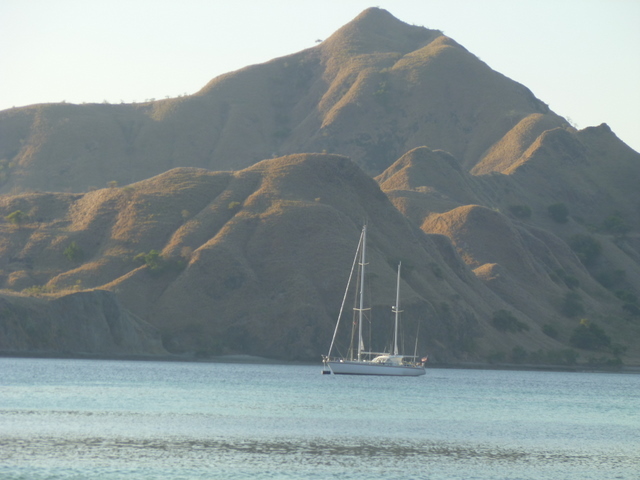 We are currently anchored off of Teluk Sorolia (Sorolia Bay) on Komodo Island. The is no habitation on the shore that we are facing, only five large wild pigs (boars) walking up the beach looking for something to eat. They are quite skittish since they are preyed upon by the Komodo Dragon, the largest reptile in the world. The dragons are up to 10 feet long (a lot of that is tail) and 220 pounds. They prey on every creature on this island and the neighboring island of Rinca (aka Rinja and Rincah), including (Asian) buffalo, deer, monkey, and the occasional human. They look and move like creatures from a 1950s Japanese horror movie. More on this later, first I need to get our blog caught up with our movements since the last posting. 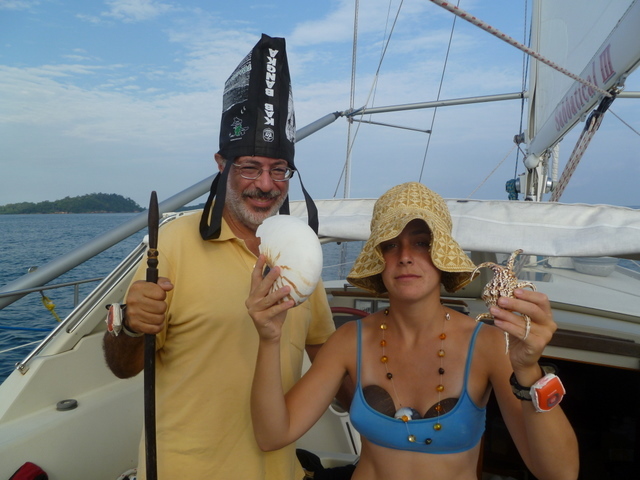 We left Riung, Flores on August 16th for our third attempt to find the right conditions to sail to Labuan Bajo. The seas were quite flat so that even with light winds, we could make decent progress under sail alone. We averaged less than 4 knots of boat speed but we sailed 90 percent of the way, and it was a beautiful night with an almost full moon. Diesel is hard to come by and we hate to motor anyway. Labuan Bajo has trash everywhere and is charmless. We were able to get 6 of our jerry cans filled with diesel (there are no fuel docks for yachts in Indonesia), get some fruits and veggies at the market, and have a couple of restaurant meals. The internet service was so slow as to be essentially unusable. 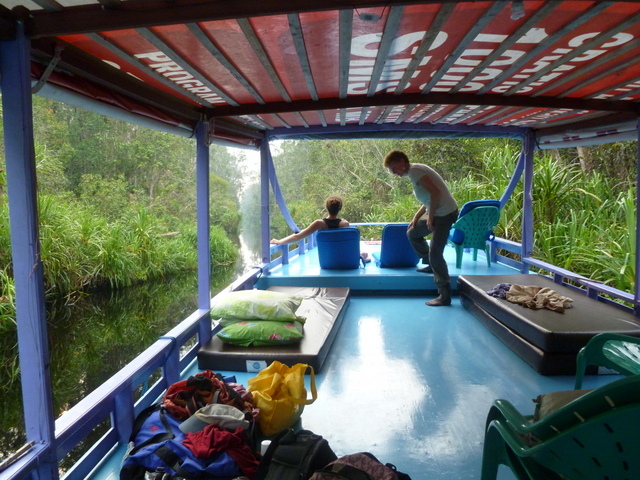 On August 20th (Saturday) we sailed to Rinca Island and anchored in Loh Buaya Rincah, a narrow fjord-like bay. We were one of four Sail Indonesia Rally boats anchored there, three of which are Amel’s like ours. Rinca and Komodo island (and some smaller adjacent islands) make up Komodo National Park, which is also a UNESCO World Heritage site. 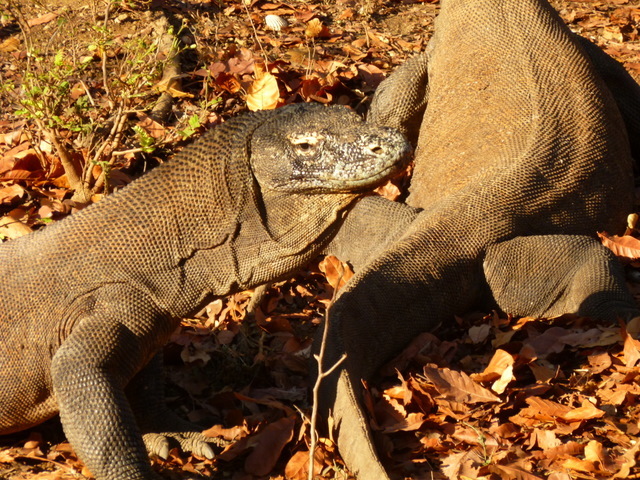 This is only the place in the world with the magnificent Komodo Dragons. We did two treks over two days on Rinca Island, accompanied by a National Park ranger, who carried a long forked stick in case he needed to keep aggressive dragons at bay. It is a Park requirement that tourists walk accompanied by a ranger as the dragons are not that picky about what they eat. We saw at least ten dragons including some large males. Yesterday to sailed to Teluk Ginggo some miles to the west of Loh Buaya Rincah but still on Rinca Island. We encountered something we had not experiences for some weeks — strong winds. 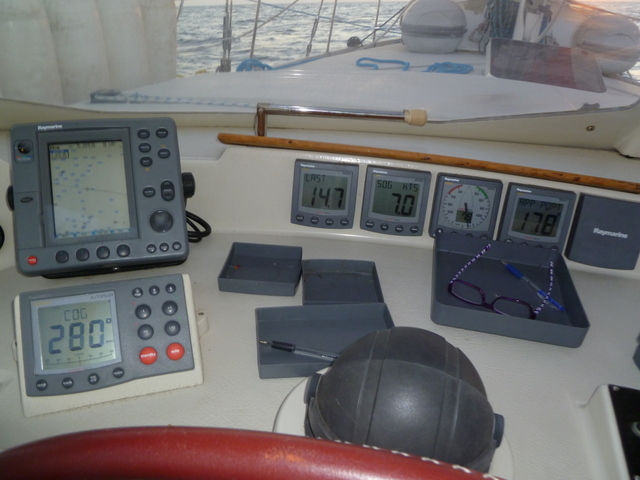 We zoomed along at over 9 knots, some of which was current. The anchorage was fine and there were monkeys and dragons on the beach, although not mixing socially. Today we were were almost two-thirds of the way to an anchorage on the south end of Rinca Island when the wind began to gust 30 knots on the nose, The current also seemed to turn against us as well. 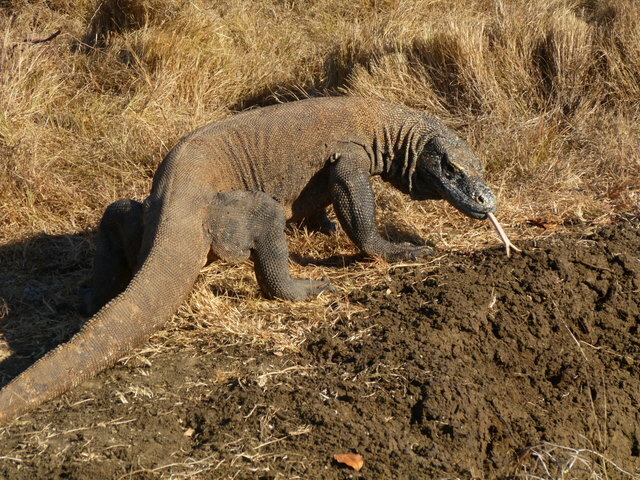 It seemed like it would be a hard slog to weather, so we bailed out and turned around and headed for Komodo Island. The currents are very strong, and with the strong wind and coral and rock bottom, it was difficult to anchor the boat at the first place we tried (between Komodo and Punja Island). The boat would not turn head into the wind as the current was so strong. We sat with our beam into the strong wind for a while deciding what to do when a small local boat came up and said that it was dangerous to anchor where we were due to the current. We had two local young men come on board and they led us around a headlands to the northwest were we are now anchored in sand off the beach with 5 wild pigs. It is comfortable and I will certainly sleep better at night here than in the previous place that had the churning current and winds. 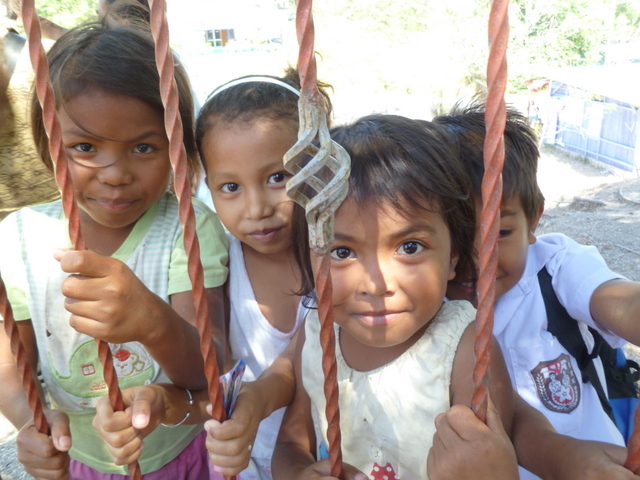 Our new friends who come from tiny Komodo village and they will take us to the park tomorrow in their longboat. We bailed out of our planned 28 hour passage to Labuan Bajo after a few hours. The winds were too light to sail and there was an uncomfortable swell from the north. So we anchored out in Ciendah and tried again the next morning. Same outcome — light winds and uncomfortable swells. So we are now in Riung (since yesterday) and looking to leave tomorrow. 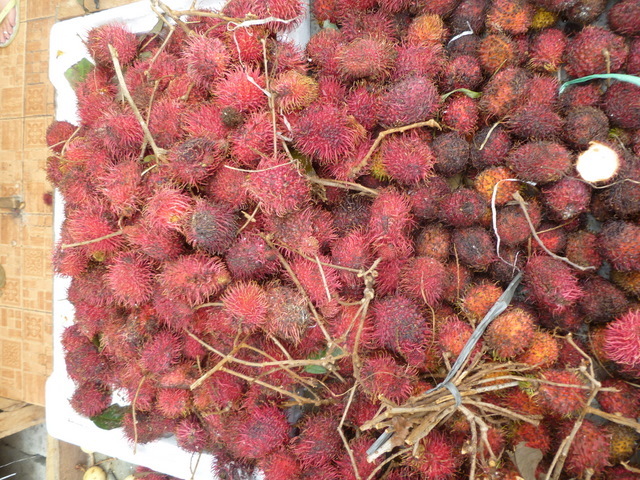 We had a nice walk around Riung today and bought some fruits and veggies at the market. 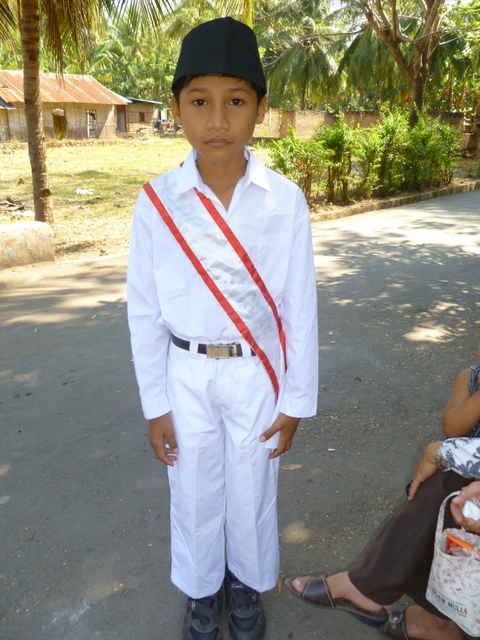 Here are some photos taken since we left Kupang. It is Friday evening and we are about to start our third night anchored on the west side of the rocky peninsula known as Batu Boga. This is a very small bay with steep hills on three sides and a coral reef to the west. There is room for at most 3 sail boats. There is no village here, just a simple compound with an extended family that fish and plant yams. There are few trees and those trees are occupied by monkeys that we have heard but have not seen. It is a beautiful and peaceful place. We have developed a very nice relationship with the family. We have an excess of goods to give away, particularly children’s clothing, and this family with 7 children has been the recipient of bag loads of clothing, toys, freshly baked banana bread, batteries, sunglasses, and assorted other stuff. They are sweet people with a cute gaggle of children. This bay has decent snorkeling and excellent water quality, except at low tide. We were able to get in the water and give the waterline of Sabbatical III a good cleaning, as well as remove marine growth from the rudder, keel, and knotmeter. Every afternoon about 6 to 8 small (20 foot) Indonesia fishing boats arrive here from Maumere and anchor quite close to us in very shallow water (3 feet). They bath, collect some kind of sea critter from the bottom that they just pop into their mouths, and cook supper. They laugh and joke with each other and make good natured comments about us. 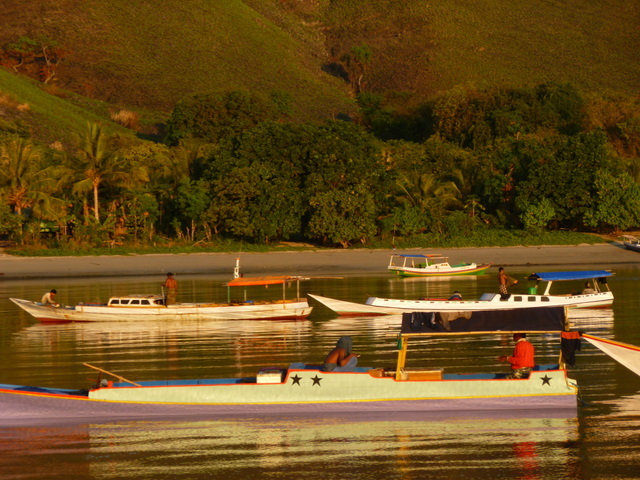 An hour after sunset they all leave to spend the night fishing and then return to Maumere, about 25 miles away. We arrived here from Pulau Besar in the company of the Australian boat “Freeform” with Dale and Sophie onboard “Freeform” is a Freedom 32 sloop built in Warren, Rhode Island and is just a smaller version of our previous boat “Sabbatical II”, a Freedom 38. We connected up with “Freeform” in Wailamung two days prior to arriving here. 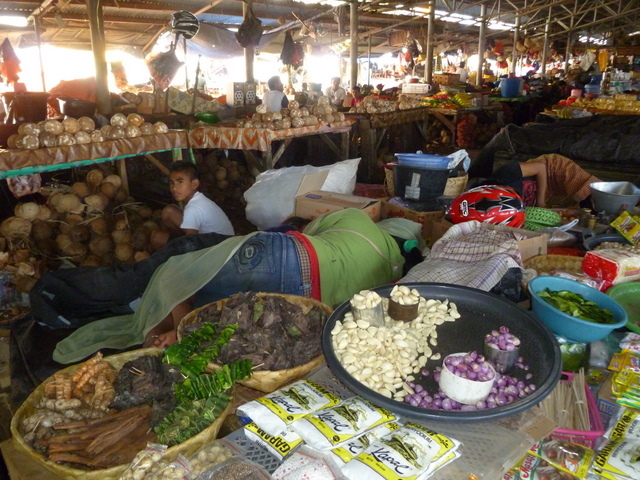 Wailamung was nothing special except that we were there for the once a week market day (Tuesday). 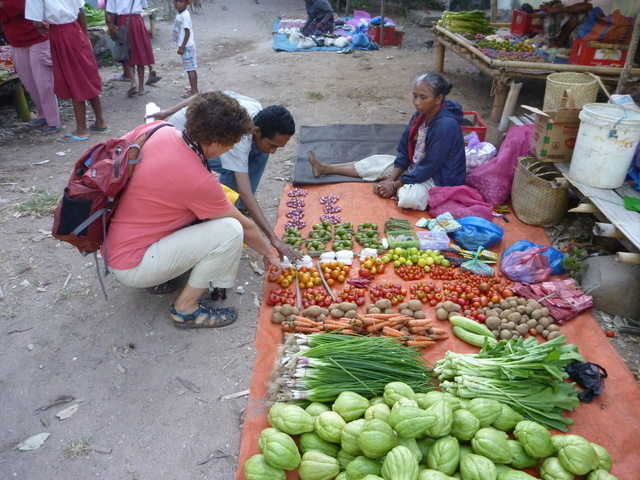 This is a poor island and it is the dry season, so there was not very much of interest to us even in the weekly market. No eating bananas, just plantains. We did buy a couple of pineapples, some tomatoes and bok choy, and some yams, and these were welcome additions to our diet. From Wailamung we sailed in company with “Freeform” to Pulau Besar, a small, very steep island a few miles offshore the big island of Flores. We anchored in a small, protected bay opposite a Muslim fishing village containing about 10 houses in a single cluster, and a mosque. It seemed a peaceful place until it was just about time for evening prayers. We heard a small generator start-up, and then shortly thereafter the muzzein’s call to prayer was blasted from a loudspeaker even though all of the houses were in easy earshot of the mosque and each other. At 5 am the generator was started up again for the morning call to prayer. There was no way one could sleep through it. We needed to be on our way to Batu Boga anyway, so it was no matter. Tomorrow morning we will leave for the 145 nautical mile passage to Labuan Bajo at the far western end of Flores Island. We will try to sail (as opposed to motor) this distance even though the winds are almost always very light. We sailed to Batu Boga in light winds, averaging a slow but comfortable 5 knots, and that is all we can hope for tomorrow. It should take us 24 – 28 hours to get to Labuan Bajo. “Freeform” is making the same passage as well. 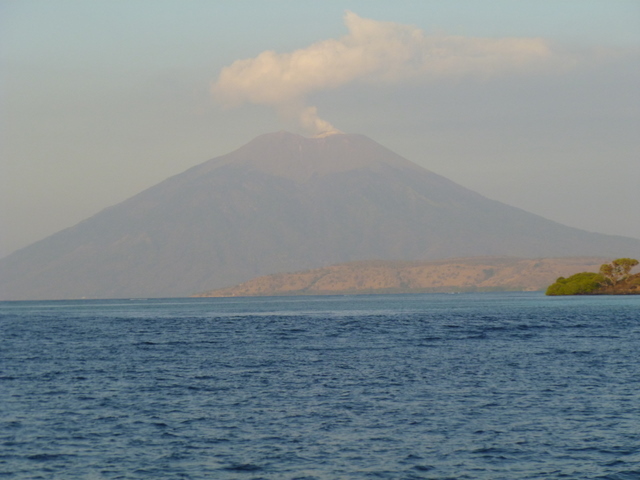 We arrived at Tanjung Gedong on the northeast end of Flores Island yesterday after a motor/sail in light winds from Kroko Islets. It is a very pretty and protected small bay. 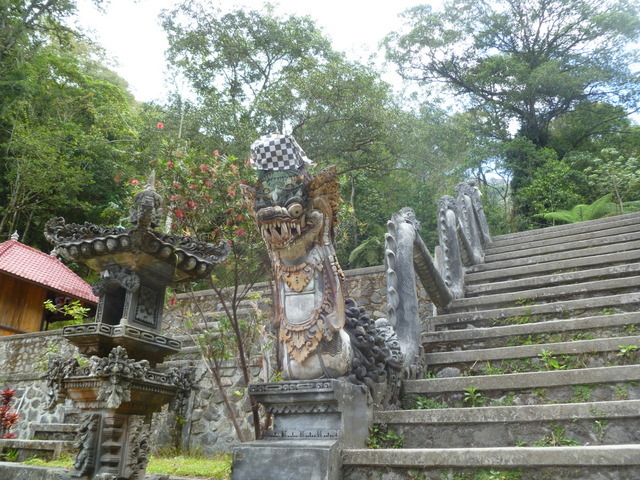 Coming from the east, there is nothing but steep cliffs dropping into the sea until Tanjung Gedong. Even here, the small village is on a fairly steep cliff and the water depth increases quickly away from the beach. We are anchored on a rock shelf just ahead of a 50 meter precipice. On arriving, we were visited first by local children in wooden canoes (sampans), to whom we offer lollipops, and then by Niko, a poor fisherman with two beautiful helmet shells that Laura loves. We traded a new Chinese digital watch, some children’s clothes, and some fish hooks for the shells. When we took our kayak to shore, there was a man waiting for us. He is Josef, a man in his forties, who had accidentally hacked his big toe with his machete while working in his garden. He asked if we had medicine to treat him. So we went back to the boat, put together some first aid supplies, and returned to the beach. As numerous locals looked on, I cleaned the wound, applied antiseptic spray and antibiotic ointment, and bandaged the toe. 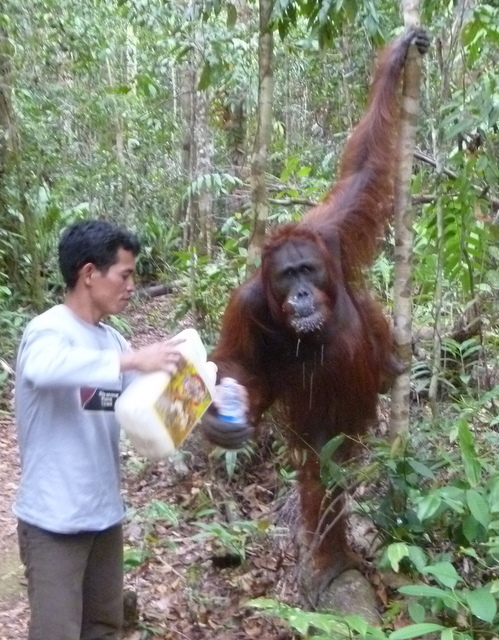 I also supplied Josef with antibiotic ointment and told him to reapply ointment and a fresh bandage in a day. Laura and I then walked up the steep hill to the village, with Josef hobbling after us. He invited us into his family compound where he lived with his father and mother, wife and children, and siblings and their children. They served us delicious Flores coffee and we took a couple of family portraits, and we said our goodbyes. Back on the boat later that evening, we decided to stay one more day and have a good look at the village. Early in the morning Josef, and his son Josef, paddled over to Sabbatical III with some gifts of tubers (ubi kayu) and plantains, and stayed for coffee. 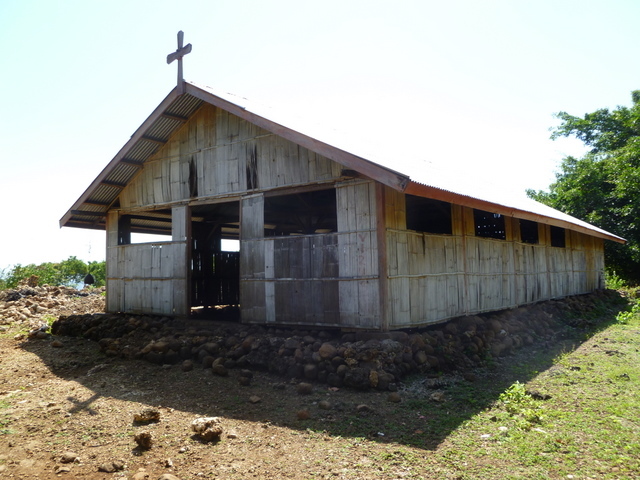 When we came back to the village, he showed us the ceremonial pavilion (rumah adat), the large but simple Catholic church, the water system, and the long broken power generator. Everyone was returning from church in their Sunday best. 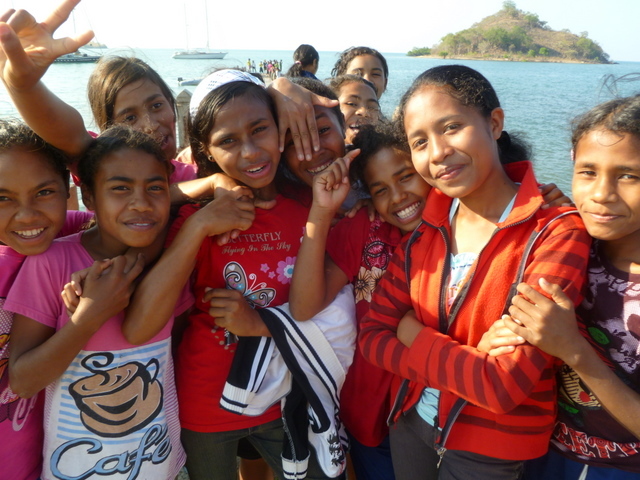 The people in the far eastern end of Flores island are of the Lamaholot ethnicity. They are more Melanesian (as in Fiji) in appearance then people in most of the rest of Indonesia (such as Java and Bali), who are considered “Malay.” They are also Catholic from way back. The remaining ship of Magellan passed these shores around 1500, soon followed by Dominican missions. 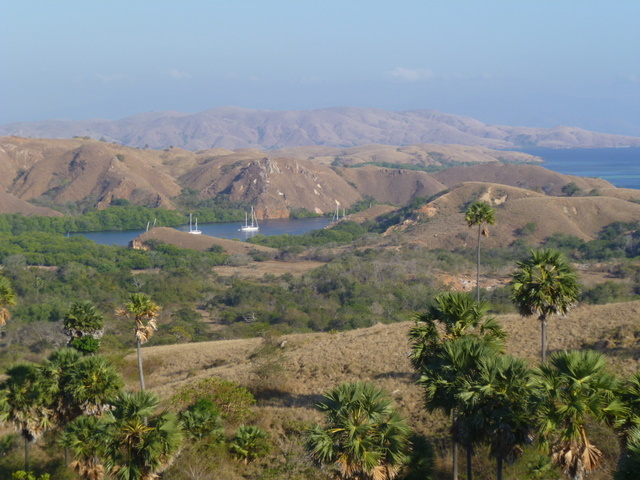 This end of Flores island became a center of Portuguese trade and mission work in the East Nusa Tenggara region. The nearby town of Larantuka has a cathedral, which Josef and his family pray at once or twice a year, and a seminary that supplies the priest that visits this village regularly. 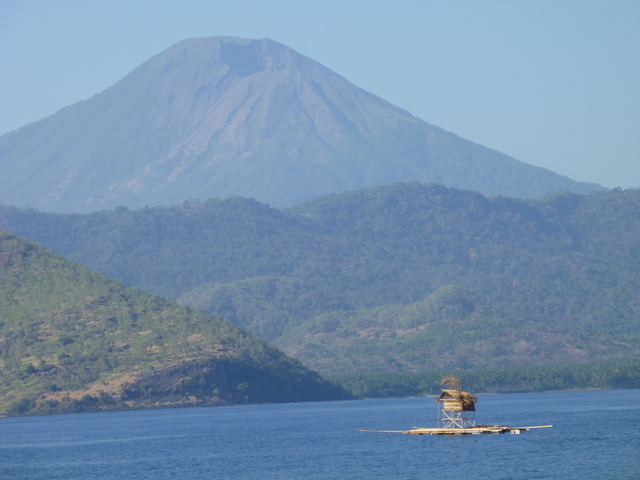 The Portuguese did not leave Larantuka and the surrounding area until 1850, when they sold it to the Dutch. (The Portuguese kept East Timor until late in the twentieth century, but that is another story). We visited Josefs family compound again and exchanged gifts, had coffee and fried plantains, and returned to the boat. It was a very nice day (and Josef’s toe is much improved). 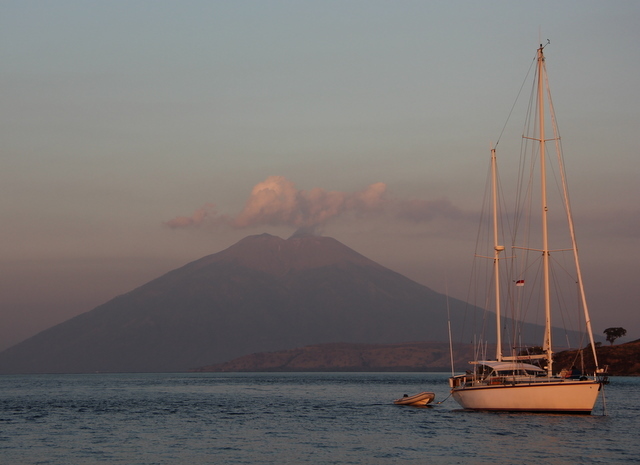 Tomorrow we will sail on to Waimalung, about 25 miles further west on the northern coast of Flores. 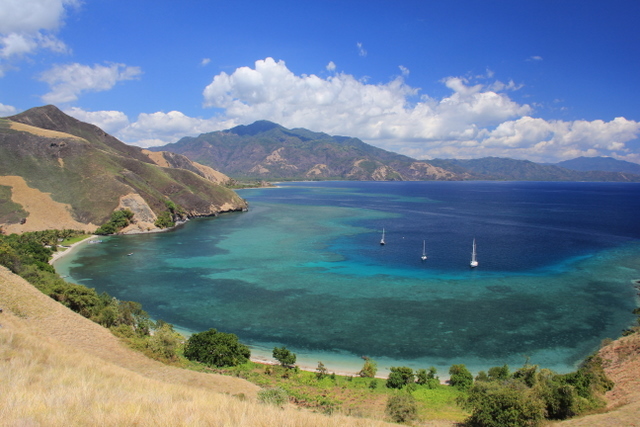 The island is over 200 miles long, and we will be day sailing along this coast of Flores for a about 3 more weeks. 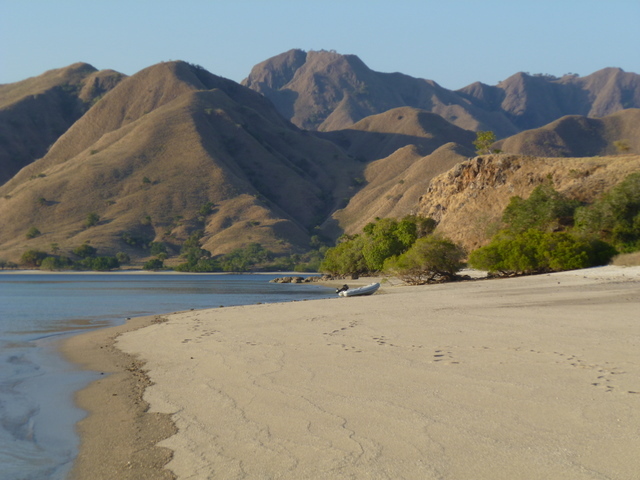 We are currently anchored at the the tiny and uninhabited Kroko Islands just off of the northeast tip of Adonara Island. We were looking for clean water where we could swim and safely use our water maker to refill our tanks, and this place fits the bill. Three massive volcanoes overlook the anchorage. There is a small village of fisherman about 2 miles away on Adonara Island. Every morning, one of them paddles out and sells us bananas, papaya, and drinking coconuts. The snorkeling here is surprisingly good. There is almost always a strong current so we take the kayak or dinghy up-current, get in the water while holding onto a long rope attached to the kayak or dinghy, and drift back. Not a lot of fish or coral, but what there is is colorful. In coming here, we departed from the route of the rally which was going to Alor Island, with another branch going to Rote Island. We have no need for scheduled events and crowded anchorages. Many other boats left the wrally as well and some of them found their way here. Our overnight sail from Kupang to Lembata Island had some pretty good wind for most of the way — a pleasant surprise. After arriving, we spent only two hours anchored in the southwest corner of Lembata Island as we saw that there was some wind and current going north up the strait, so we decided to take advantage of it. We went into Lebaleba Bay and anchored near the ferry dock of the town of Lewoleba — the commercial center of this small and seldom visited island. We thought we would go ashore and have an adventure the next day but, unbeknownst to us at the time we anchored, we were 200 meters away from a karaoke bar that blasted bad music until past 2 am. Laura could not sleep even with ear plugs. So first thing in the morning, we left and went to our current position at Krako Islets where there is no town and the water is clear. The water is filled with trash in both Kupang and Lewoleba — plastic bags, juice boxes, empty plastic bottles, and assorted detritus. I would not run the water maker in either of those places. Last night, as Laura and I sat at the bow of Sabbatical III to watch the fiery red sun set into the sea, we suddenly spelled something bad in the air — almost like skunk. We could not quite place it, but it was unpleasant. About 2 hours later some friends on another boat that had just arrived earlier that day called us on the radio to ask if it was usual for the volcano to our south to be spewing lava. We had been here for 3 nights and had seen no such thing so we went of deck and sure enough, lava was streaming down one slope of the volcano. The volcano is a few miles away, so we did not feel at risk, but I did mark in my mind the way through the reef in the dark to get to open sea. The smell, of course, was sulphur and other volcanic gasses. The volcano is just smoking a bit today, but then so are the other two volcanoes that are in view. We had a 3 day sail from Darwin to Kupang: 1st day light winds and combination of sailing and motor/sailing 2nd day light winds and rolly 3rd day – perfect conditions for sailing with our double head sails poled out. Had to slow down at the end in order to arrive after sunrise. Wind right from behind, but it was a good sail overall compared to what we had been expecting. Lots of wind since we arrived in Kupang – calm at night and then winds 15-20 during the day. We think the winds are just local and will probably die out as we head north. Our check-in at Kupang with all the Indonesian officials went quite well. Tons of officials to see and papers and stamped documents to give and get, but it all went pretty smoothly. A few people who got here early (before the officials could figure out how to proceed with their masses of paper) ended up having a more difficult time than those of us who arrived on the expected days. The officials were pretty serious about their paperwork but most were quite friendly. Those who came to inspect the boat seemed to be quite hungry and thirsty, but it did not take much to make them happy. The harbor is not clean and the place we land our dinghies has filthy water – particularly at low tide. There are a group of “boat boys” who have managed to commandeer a going rate of 35000 rupiahs a day to help with dinghies (about $3.50). This is a very high price for Indonesia, but unfortunately, once a few cruisers agreed to this, the price seemed to be set. 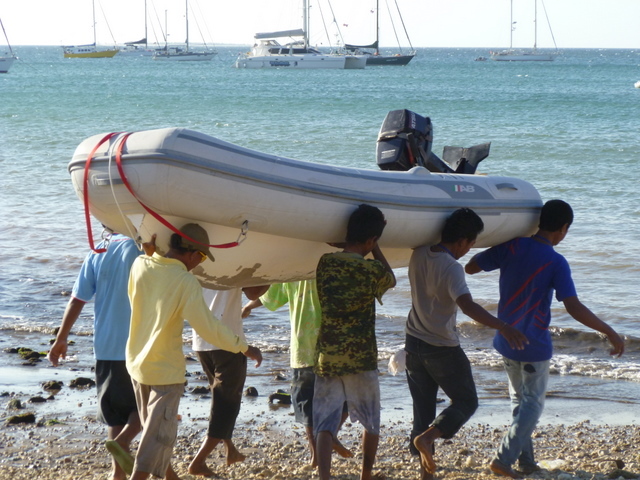 The service, is however, really nice to have as they are very helpful and they lift the dinghies up and out of the water for you when you arrive and bring them safely up the beach, and then they carry them right back into the water for you when you leave and even push you off. It’s so helpful. They will do it as many times a day as you want for that set price per day. All the prices have been jacked up very high for us cruisers – but compared to Australia things are still cheap. Bananas are under $1 for a big bunch compared to the $2 each piece that they were in Australia. A delicious lunch out will cost you anywhere from $2 to $4. Mark finds the most delicious restaurants and impresses everyone with his knowledge of Indonesian culture and food. Almost all the people we have met have been very happy to meet us and the kids are full of smiles. 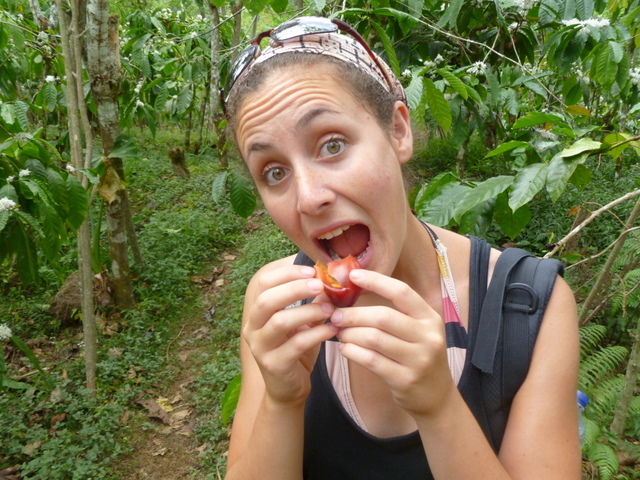 We just love the food here… it is so tasty! There are a few dishes that I remember vividly from our time spent in Indonesia nearly 30 years ago. I was afraid that they wouldn’t be so good after so many years, but they are still amazingly tasty. Fuel…. This has been a bit of a headache. It was promised that fuel would be available for all the boats – many of whom are greatly in need of it – and I think everyone eventually got what they needed, but it was not easy. You have to get your fuel only from some guy down at the beach and he apparently did not grease the wheels well enough at the sole fuel company of Indonesia (Pertamina). Some people were promised fuel delivery to their boats and waited an entire day or more without anyone showing up. Others were promised fuel if they brought their jerry cans to the beach, but also had to wait a long time, or go with less than they were promised. The price of fuel doubled for a short while from the original price that was posted, but I think that too many of the sailors refused to pay (thank goodness) and the prices suddenly dropped back to what was promised. We managed to get some fuel today after making friends with one of the very nice ladies from the tourist office, who is welcoming the boats here. Mark told her he was interested in eating Indonesian fried chicken and she immediately offered to take us to a good restaurant using the government automobile ( a super nice air-conditioned SUV). It was a fantastic meal and on the way back she asked us if there was anything else we wanted or needed and we mentioned fuel and she whispered that she could help us get some. An hour later we had 60 liters of fuel delivered to the dock. 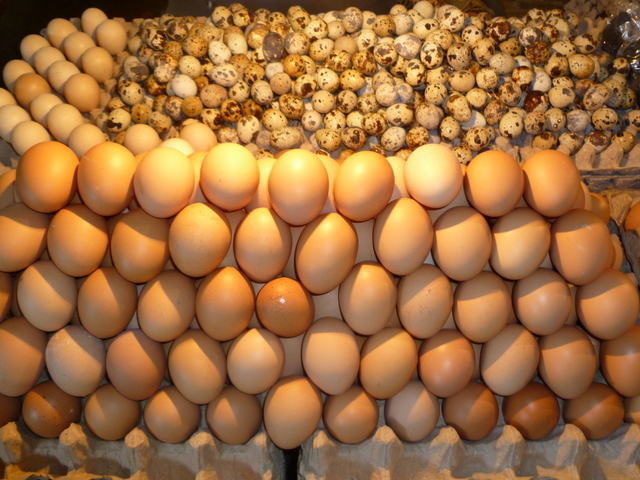 Today we got another 60 liters so we are all set – just a tiny bit short of full. The other boats on the rally are a uniformly nice and very friendly group. There are about 75 boats here with us. We know lots of them from our trip up the coast and lots more from being in Tipperary Waters Marina. We continue to meet new people every day and we feel we really are lucky to have such a great group with us. The rally organized a big festive welcome dinner last night and everyone came. There were some speeches and thank you’s and then a nice buffet dinner and a bit of Indonesian music and then they suddenly started playing really loud rock and roll and jazz and blues . One of the singers was dressed head to toe in a hijab, but she was belting out rock and roll like a pro. Then our tourist agency friend turned up on the stage and started belting out songs like Aretha Franklin. It was pretty amazing. At first I was disappointed because I had wanted to see and hear Indonesian music and dance, but then all the cruisers started dancing and we joined in and had a great time. They are having a second welcome party tonight but we are too exhausted to go. We are leaving Kupang for Lembata (also known as Lomblen and Kawula) in about 30 minutes (3:30 pm local time). We will anchor at Tangung Liang Meah at the far southwestern end of the island. It is a passage of about 105 nautical miles. We should get there sometime tomorrow (Monday) morning. It is quite windy here in Kupang but we expect only 5-10 knots of wind once we are a few miles from shore. The map shows Darwin (red icon) and Kupang, Indonesia, on the island of Timor (yellow icon). We are anchored along with about 60 other boats off of the waterfront of Kupang, the provincial capital of the East Nusa Tenggara province, after a 3 day sail from Darwin. We finished our check-in today. There were numerous stations to stop at – quarantine, health, customs, immigration, and port captain – some stations had multiple stops. Everyone was very friendly as lots of forms were filled out, and each form was stamped multiple times, and entries were made in log books. We attested that no one had died en route, that there were no stowaways onboard (if you know about them then are they still stowaways? ), etc. We then found a bank with an ATM that worked, a telcom office from which we bought a SIM for our cell phone and a cellular modem, and then a Padang restaurant for lunch where Laura could finally eat some rendang (buffalo meat boiled in coconut milk and spices), one of her favorite dishes, for the first time in 30 years. The sail here from Darwin was very good – on average. The first day we had light winds and seas that we could sail with a poled out spinnaker on one side and a poled out genoa on the other. The wind slowly died late in the afternoon but then came up briskly and on the beam (from the south) just at sunset, so we rushed to take down the two headsails and reset our sails. The wind became light and right from behind late at night, the waves became steep and from three different directions, and the boat started to roll uncomfortably. We reset a sail on a pole but every few minutes the sail would collapse as the boat rolled and then come back with a jolt that shook the rigging. I hate conditions like that. If the seas are uncomfortable you should at least be able to go fast. We wound up motoring for most of the second night as the shock loads on the rig made me uncomfortable. Dawn brought some relief – the seas became more regular and the wind picked up a bit. As the sun rose, we reset the spinnaker and genoa on poles and hoped for the best. What we got for the rest of the journey (about 25 hours) was as nice of a sail as one can possibly have. Conditions became perfect – plenty of wind and swells so rounded and well spaced that down below in the boat you thought we were still sitting in the marina. Plus, dolphins kept stopping by for a quick visit to leap for us and then dart off. At one point, Laura called me down to the head (bathroom) to check on a squeaking noise. When I went down to check she came up to the cockpit and discovered the source of the noise – small whales were around the boat squeaking to each other. Just before sunset, a big pod of dolphins decided to put on a 30 minutes exhibition of synchronized swimming and jumping. The night was clear and full of stars and the ocean was glowing with phosphorescence. So a glorious day 3 more than made up for a crummy day 2 and was more than enough to make this a very good passage overall. It is very nice to be back in Indonesia after so many years. I had nice chats in Indonesian with the Port Captain and the Customs guy, who invited me for a beer, with people in the street, and with the mother-and-daughter restaurant proprietors. After all those years of Indonesian language study, and all the time that spent in Indonesia mostly many years ago, it is nice to find out that I have still retained my language skills. We arrived safely in Kupang, Indonesia this morning after a pretty good sail from Darwin. Details to follow. 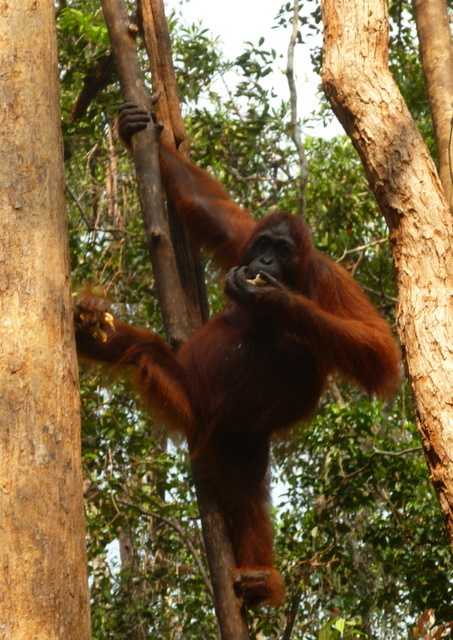 We have completed the first 2 days of our planned 3 day trip to Indonesia from Darwin. Only about 150 miles to go and we hope to be anchored in Kupang (on the southwest corner of the island of Timor) by tomorrow afternoon. The first day sailing out here was slow, but very gentle, yesterday was slow and uncomfortable with too much swell and too little wind, but today is perfect – the right amount of everything and we are flying smoothly along at 7 to 8 knots under blue skies. Lots of dolphins in these waters and we have already had some visits from them – hoping for a big show of them somewhere along the way. Tomorrow (Saturday), morning at 0830 we will go through the lock of the Tipperary Waters Marina, drop to sea level, and enter the waters of Frances Bay to begin a 474 nautical mile (878 kilometer) passage to the city of Kupang on the island of Timor, Indonesia, as part of the Sail Indonesia 2011 Rally. Approximately 110 sailboats (and two power boats) from all over the world are participating. You can check out the web site at http:\\www.sailindonesia.net. Our trip takes us on a course of about 285 degrees true through the Selat Roti (Roti Strait) and the Selat Semau (Semau Strait) to an anchorage in front of Teddy’s Bay, Kupang. We have been working hard getting Sabbatical III ready to cruise Indonesia. I had some navigational equipment fail, so I ordered new equipment from the US three weeks ago. That has not arrived. So a few days ago I ordered similar equipment from Sydney with a promise of next day delivery. There was a problem at the Sydney airport Wednesday night that backed up flights badly and it only just now (Friday afternoon) arrived into the Darwin airport. I cannot get it though because it is a public holiday in the Northern Territories as today that marks the start of the 3 day “state fair.” Realizing that neither of my orders would arrive in time, I have cobbled together something that works with help from an electronics shop, some creative wiring, and some soldering. It looks ugly but it works. Another vessel that has to stay behind to repair their rudder will bring my equipment to me in Indonesia when they depart in about 4 to 7 days. 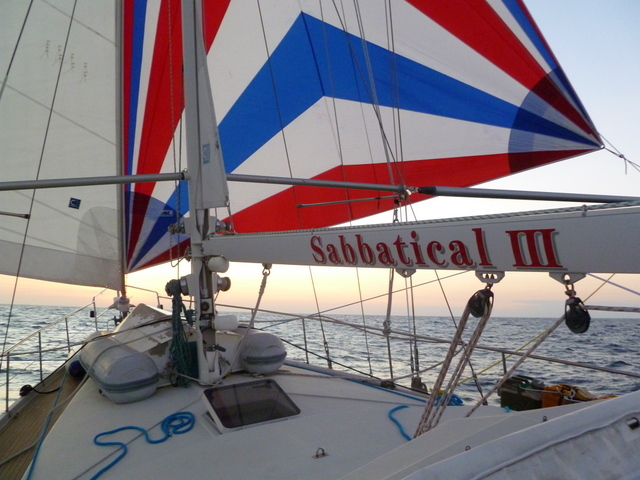 Other than that, Sabbatical III is in excellent shape and full of provisions, fuel, and water. We have really enjoyed our stay in Darwin and have met some great people. 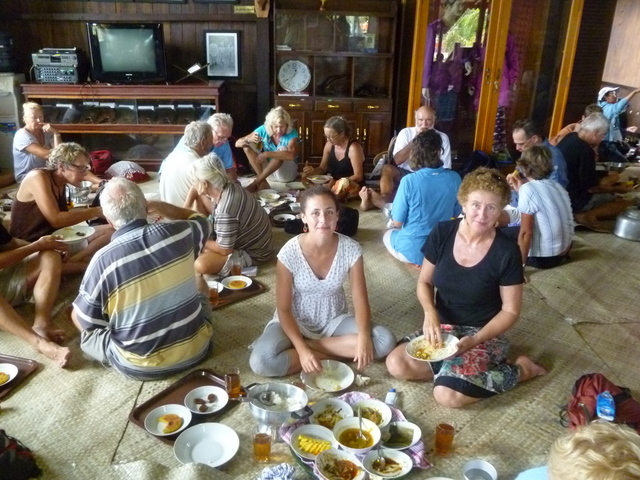 We are looking forward to getting underway again and to the start of our 3 month trip through the Indonesian archipelago. 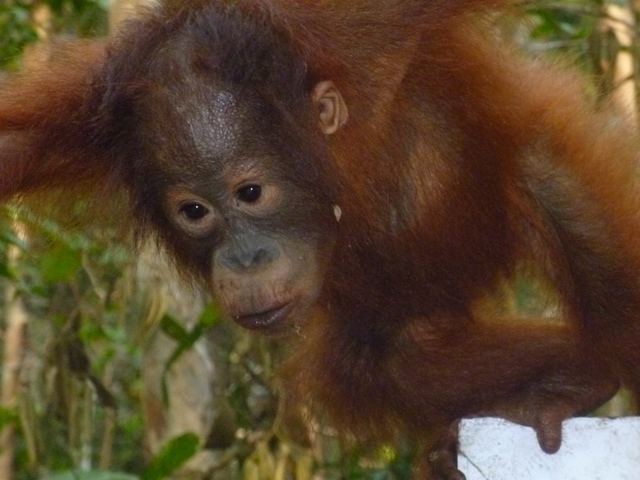 Another big step towards Darwin! We just finished a 56 hour sail from Mt. Adolphus on the far north-eastern tip of Australia across the vast Gulf of Carpentaria (GOC) and arrived at a safe and comfortable anchorage on the western side of GOC at the Wessel Islands. We are now another 360 miles closer to Darwin. About 400 to go…. The very cool part about the trip was the first 6 hours when we left Mt. Adolphus and had to pass by several small islands (including a Tuesday, Wednesday, Thursday and Friday Island) and a number of reefs before entering into the open and unobstructed waters of the GOC. The area is called the Torres Straits and it is a band of water that flows south of Papua New Guinea and just over the northern coast of Australia, connecting the Pacific and the Indian Oceans. It is famous for its boat traffic and its strong currents. If you time the currents right (which we did) you can pick up an additional 5 knots of boat speed. That means that if you are sailing along at 6 or 7 knots (a typical speed for us), you can suddenly be going 11 or 12 knots. We had a crystal clear day and the seas in the Torres Straight were flat and aquamarine blue and we absolutely flew along for the first few hours at speeds of up to 12 knots. It was really amazing. We were sailing with a new friend of ours, Northern Winds, who has a magnificent boat and they were blazing along at up to 14 knots. We had another surprise at the end of the trip when we rounded the northern most tip of the Wessel Islands – a long, thin strip of islands that mark the western border of the Gulf of Carpentaria. As we approached the tip we noticed that the water ahead of us was a totally different color and swirling and filled with white-caps. Suddenly we were in the most beautiful, strange, and furious looking water that we have seen for some time. We had arrived at the tip of the island (where currents and wind can be strongest) at a time of day when the current was moving towards us while the wind and waves were coming up behind, making a confused and swirling sea state. The water was 50 meters deep, and obviously soft white sand on the bottom and the whirling water was creating patterns of various shades of blue, depending on how much sand was swirling up. The swells were large and it was difficult to go faster than 2.5 knots (rather than the 8 knots we were doing just before that) because the current was pushing us one direction while the wind was pushing us another. The water was such a beautiful color – which I have tried to capture in pictures and video. We were glad to have reached that point while it was still daylight and while the winds were relatively light. I would imagine it would be unnavigable during certain conditions. Once we turned the corner at the tip of the Wessel Islands we were out of the churn and the tumult and we proceeded another few miles down the coast to a beautiful protected anchorage where there are 6 or 7 other boats – all heading to Darwin. Slept about 12 hours last night and feeling fine…..